I have been eating terribly lately. I don’t know if it’s my age or just that I’ve fallen into some bad habits, but my weight has been creeping up in the last year. I hate to admit it, but I think my metabolism is starting to go into the toilet. I’m going to be 44 next week, and this is the first year that my age is starting to bother me. I feel like my body is starting to fail me. In the last year, I’ve had to start dying my hair, get glasses and gained 10 pounds. That isn’t even mentioning the pre-menopausal systems that have plagued me. So I started keeping a food journal, I’ve cut out processed sugar and upped the amount of exercise I’ve been getting. I do find comfort in picking one or two meals and snacks that I can keep in the fridge so that I’m not tempted to eat what I cook for my husband and son. This super vegan bowl is a super simple dish, you can make a big batch, and it’s tasty hot or cold. I’ve lost 3 pounds in a week, and I’m feeling pretty good, so we’ll see if I can keep the momentum going. I’m hoping that by confiding in you all here that I can keep myself focused and drop the extra weight that I’ve put on. This vegan bowl is the kind of dish I can eat over and over and never get sick of. The best part is I feel like I get to eat a lot but the nutrition profile is high and it fit’s into my diet. Because let’s face it, I like to eat, and I am not too into depriving myself when I’m hungry. The parsley cashew pesto is what makes this dish memorable. The lemon, garlic, and parsley make it full flavored, and the cashews add a nice richness. 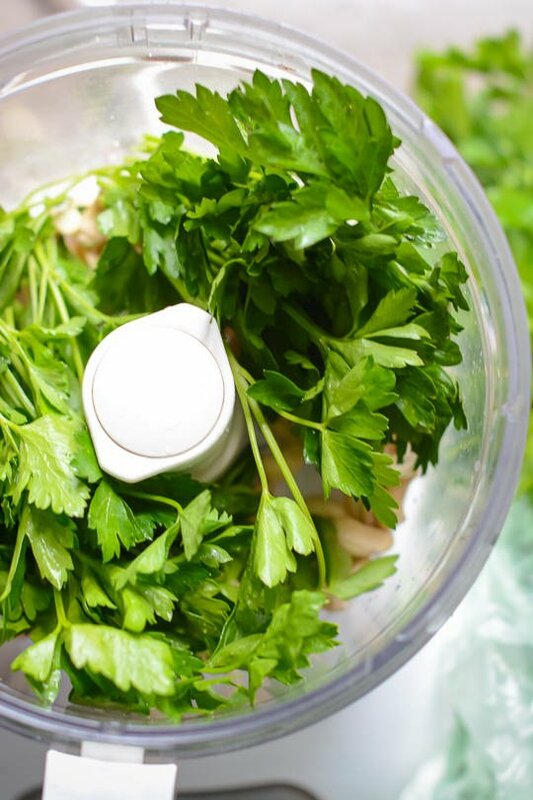 If you don’t like parsley, you could substitute basil, cilantro or even kale instead. The sauce will keep in the fridge up to a week or in the freezer for three months, and you can use it in a lot of ways. I like to use it instead of salsa in burritos, on top of eggs, and as a dip for vegetables. Cover the cashews with ½-inch of water and let sit for 1 hour or up to overnight. 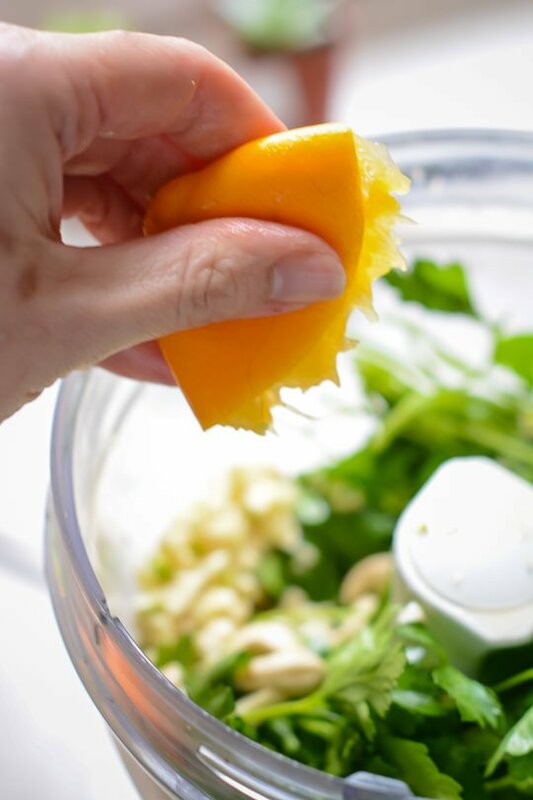 Drain and rinse the cashews and add to a food processor along with the parsley, garlic, lemon juice, salt, and pepper. Process until smooth, stopping to scrape down the sides once or twice. Taste and add more lemon juice or salt and pepper as desired. Bring ¾ cup of water in a small saucepan to a boil. Add the couscous, stir to combine and remove from the heat. Let it sit for 7 to 10 minutes. Fluff the couscous with a fork and set aside. Heat 1 tablespoon of olive oil in a large skillet over medium heat. Add the mushrooms, season with salt and pepper and cook for 7-10 minutes, stirring occasionally until all the water has evaporated and they begin to brown. Set the mushrooms aside and return the skillet to the heat. Cut the kale into 1-inch pieces, and add to the pan along with a few tablespoons of water. Season with salt and pepper, cover the skillet and let steam for 3-4 minutes until the kale is wilted and a bright green color. 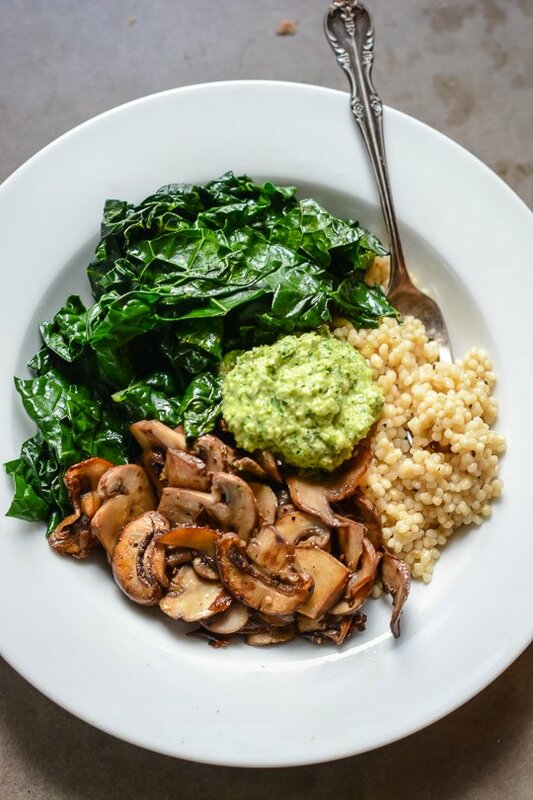 To serve plate ½ cup of couscous, a quarter of the mushrooms and kale and top with a tablespoon of the pesto. Everything else looks great, but I’m not a mushroom fan – Is there any other veg that would be a good replacement? Eggplant and zucchini are both great substitutions for the mushrooms. I hope you like it if you try it. Thank you for the kind words. If you can’t find Israeli couscous, regular couscous, quinoa or millet would all be great substitutions and I’ve used them all. Really any of your favorite grains would work in this. Enjoy! oops, typo the second time- should be ptitim! This sounds so incredibly fresh tasting and yummy. Parsley is so overlooked and underrated in this country, but it has such a powerful green flavor that it just perks up your whole mouth! This looks like the most delicious and flavorful bowl. Good for you for not giving into the deprivation game. A food journal and taking time to make what you want to have are great ideas, and it sounds like it’s working! Substituted Lundberg wild rice mix since couscous has gluten, was really delicious. Even my not interested in healthy food husband liked it! I’m so glad you liked it, I’ve been eating it every few days for the last several weeks and still look forward to it. It’s also great with quinoa or millet if you are looking for other gluten-free options! Thanks for checking out the blog and I hope you enjoy the recipe, it’s one of my favorites! I tried it and it was amazing!!! I absolutely love the pesto!!!! I’m so glad you enjoyed it. I love being able to throw everything in a bowl with a quick sauce and call it dinner! Looks good, I just might try my own version of this. That’s one of my favorite things about bowls, you can adapt the ingredients to suit your tastes and what you have on hand. I hope you like it if you give it a try! Just saw this on pinterest and looks amazing! I’ve been eating like crap lately and my body can feel it! This bowl is exactly what I need! flavorful, filling and meatless! I do the same thing. I’ll eat well for awhile and then get caught up in eating on the go and grabbing junk. It’s good to reset once in awhile and this bowl makes me feel like I’m eating something really decadent! I hope you enjoy it if you try it! Just curious as to why you cook differently for your husband and son as you do yourself? Well,in a perfect world we would all eat the same thing but my husband and son are not interested in giving up meat. I eat the way I do because I truly enjoy it and they eating the way I do just makes them miserable so I try to make something one or two days a week that we can all eat and then cook for their palates the rest of the time. Hi there – would it be okay to substitute the cashews for cashew butter, and if so how much would you recommend? Thanks! I don’t think that you will get the right consistency if you used cashew butter, but I’ve never tried it. I would try using about 1/4 cup, tasting and then going from there. You are basically making a vegan pesto so you could substitute any kind of nut that you have on hand. Walnuts, hazelnuts, sunflower seeds or pumpkin seeds would all work. If you try it with cashew butter I’d love to hear if it worked for you. Good luck! This was so delicious! I subbed Swiss chard for the kale and it was outstanding! Great recipe! I’m so glad you enjoyed it! I love using couscous in my bowls since it only takes 5 minutes to prep. Swiss chard is one of my fsvorite greens, I love to make chard and mushroom enchiladas! Thanks for trying the recipe! Of all the on-line recipes I’ve tried I make this one the most. It’s my husband’s favorite as well. So easy you don’t even need the recipe after making it a coup,e of times. Filling yet not too heavy. And delicious! Thank you so much for the feedback. I’m so glad that you enjoyed the recipe. I try to keep things simple but full of flavor. Thanks again for trying the recipe! Y U M. Made this 2x already this week. Delicious. and simple Forgot to soak my cashews and was trying to make a quick lunch so I tossed ’em in the food processor and it totally worked fine. So, soo good. Definitely going to soak them next time to see what that does to the texture! Also added a little olive oil for taste and it was yummy. Thanks so much- this recipe is a keeper! I’m so glad that you liked the recipe. Soaking the cashews will just give you a smoother texture. If you find that you prefer the soaked cashews you can always pour boiling water over the cashews and let them sit for 15 minutes. I make it both ways and to be honest I think I prefer making it without soaking. I’d love to know which version you prefer and thanks again for trying the recipe! This is so yummy! I’m getting my eating back on track and bowls/one pot meals are a staple. 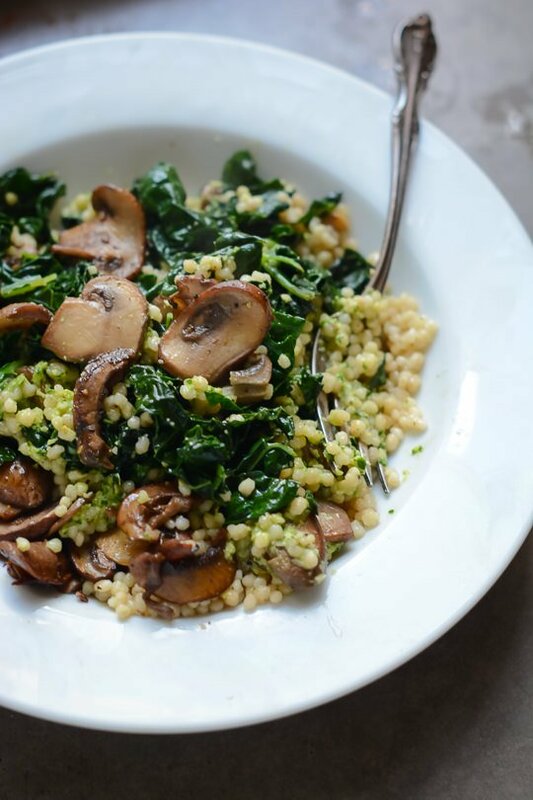 This is so tasty and flexible in terms of grains and veggies you could use. I added some basil to the parsley pesto and it worked great. Thanks for the recipe! I’m so glad you enjoyed the recipe. I’m always looking for new flavor combinations in my bowls but to me it’s all about the sauce, I usually start with that and then see what veggies and grains I have on hand. Thanks again for trying the recipe! I made it yesterday and it was more delicious than I expected, super delicious! Hi, which ingredients go into the pesto? The recipe just says to add “the other” ingredients to the cashews. Not sure which other ingredients you mean? Sorry for the confusion. You just need to add the parsley, lemon, garlic, salt and pepper to the cashews and process. I’ve updated the recipe to make the process clearer. Feel free to let me know if you have any other questions and I hope you like the recipe if you try it! Yum! I made up four of these for lunches this week.. Just ate my first one! I subbed baby bella mushrooms (couldn’t find cremini at my regular grocer). They tasted great. Turns out I’m not a fan of the parsley, it is still delicious but I added a little cholula and now it is AMAZING. Hello! Would you happen to have the nutritional information for a serving of this recipe? Thank you! 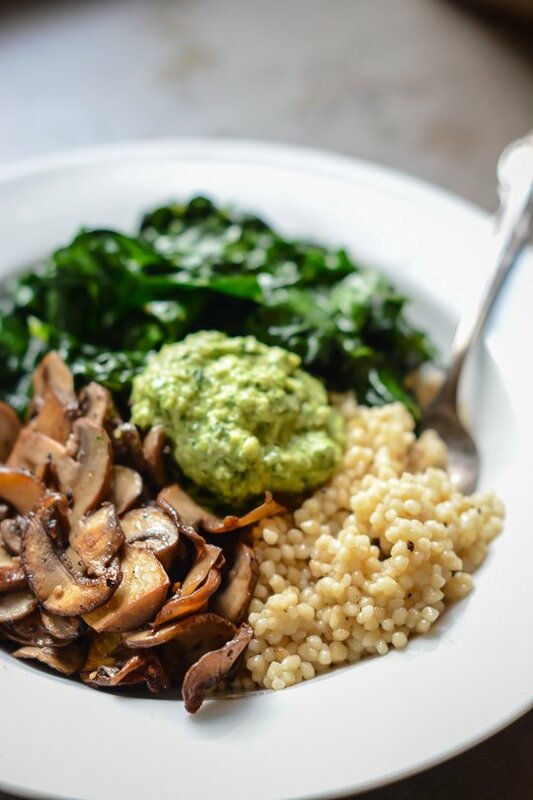 A serving of this bowl is approximately 425 calories with 14 grams of protein, 20 grams of fat (mostly from the cashews and olive oil) and 6 grams of fiber. I hope you like the recipe if you give it a try! My pesto didn’t come out smooth and creamy like yours, it was thick and chunky, but still good. We didn’t have mushrooms or kale, so I just sautéed some onions and garlic and added spinach. I also had some left over baked sweet potato so I added that as well. It was very tasty, thank you! I’m glad you enjoyed the recipe. 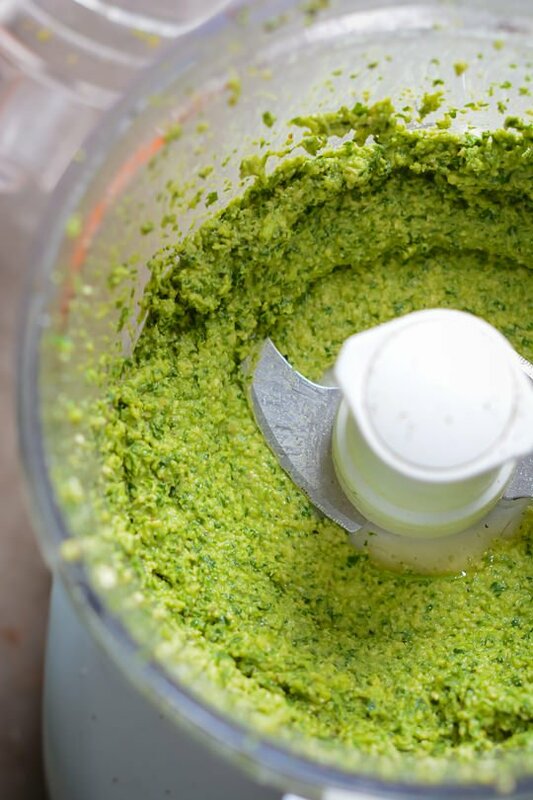 If the pesto wasn’t as smooth as you would have liked you can add a little more oil or water a tablespoon at a time and process it for another 30-60 seconds. Thanks for trying the recipe!